Rose Quartz Hoop Earring 1" dia. 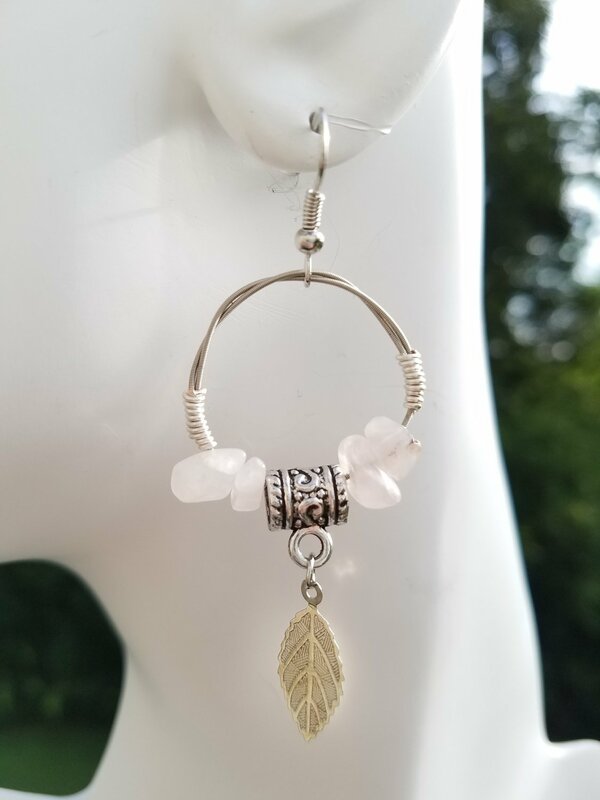 Rose Quartz Hoop Earring design with leaf adornment created from one of Trevor Finlay guitar strings. ROSE QUARTZ~ Rose quartz has been used in love rituals and ceremonies for centuries, and remains the stone of the hopeless romantic. A member of the quartz family, this crystal is made up of silicon dioxide. It’s sweet, soft pink hue is the result of both the many, tiny inclusions of pink fibers, known as dididumortierite, within the glassy stone that keep it from being totally transparent, and irradiation. This irradiation is also why rose quartz should be kept out of the sun, so as to not lose its pretty shade. With a hexagonal crystal structure, this stone typically forms into large specimen, but occasionally develops smaller, prismatic clusters as well. There is no shortage of rose quartz, which can be found in abundance in mines throughout the world. The most common sources for rose quartz are in Brazil, Madagascar, India and South Africa.